After President Trump's election, his opponents rushed to subscribe to the New York Times because the truth was more important now than ever. Now they are canceling their subscriptions because of an opinion column on climate change by the paper's new right-leaning columnist, Bret Stephens. 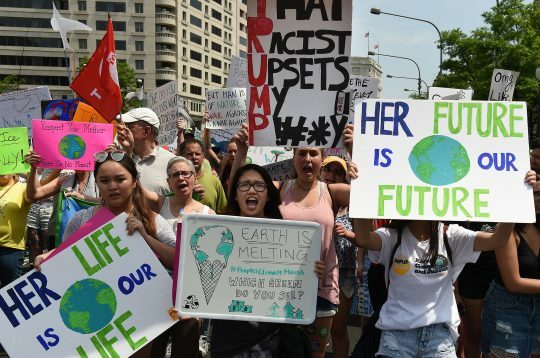 Some liberals were outraged when the New York Times on Friday published Stephens' column, which compared election pollsters' confidence that Hillary Clinton would win to climate scientists' assurances that climate change will be lead to catastrophic disaster. Many unhappy readers vented their frustration on social media and said they were canceling their subscriptions. I'm on hold with the @nytimes trying to cancel. They told me they're slammed with people canceling subscriptions because of Bret Stephens. Climate scientist Michael Mann canceled his subscription and urged others to use the hashtag #ShowYourCancellation. Even some of Stephens' colleagues have mocked their employer's decision to publish his column. The Times‘ editorial page editor released a statement that defended the decision to publish the op-ed. This entry was posted in Politics and tagged Climate Change, New York Times. Bookmark the permalink.